1. “If you will return, O Israel,” says the LORD, “Return to Me; And if you will put away your abominations out of My sight, Then you shall not be moved. 3. For thus says the LORD to the men of Judah and Jerusalem: “Break up your fallow ground, And do not sow among thorns. 7. The lion has come up from his thicket, And the destroyer of nations is on his way. He has gone forth from his place To make your land desolate. Your cities will be laid waste, Without inhabitant. 8. For this, clothe yourself with sackcloth, Lament and wail. For the fierce anger of the LORD Has not turned back from us. 14. 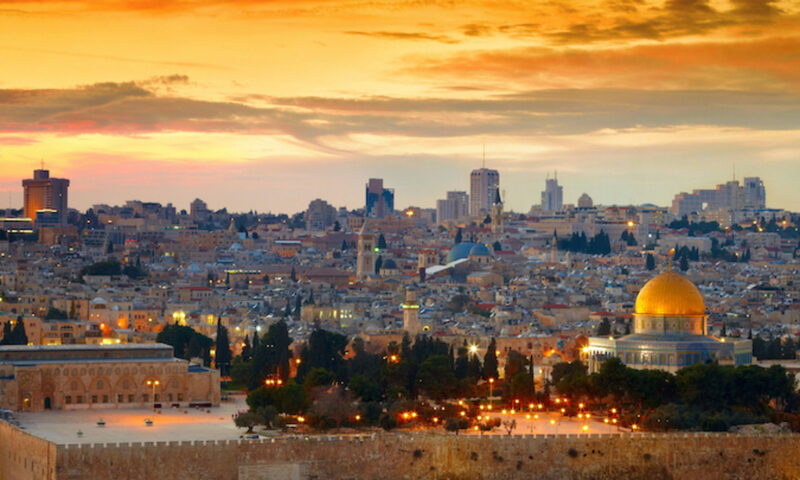 O Jerusalem, wash your heart from wickedness, That you may be saved. How long shall your evil thoughts lodge within you? 16. “Make mention to the nations, Yes, proclaim against Jerusalem, That watchers come from a far country And raise their voice against the cities of Judah. 17. Like keepers of a field they are against her all around, Because she has been rebellious against Me,” says the LORD. 19. O my soul, my soul! I am pained in my very heart! My heart makes a noise in me; I cannot hold my peace, Because you have heard, O my soul, The sound of the trumpet, The alarm of war. 20. Destruction upon destruction is cried, For the whole land is plundered. Suddenly my tents are plundered, And my curtains in a moment. 21. How long will I see the standard, And hear the sound of the trumpet? 23. I beheld the earth, and indeed it was without form, and void; And the heavens, they had no light. 24. I beheld the mountains, and indeed they trembled, And all the hills moved back and forth. 25. I beheld, and indeed there was no man, And all the birds of the heavens had fled. 26. I beheld, and indeed the fruitful land was a wilderness, And all its cities were broken down At the presence of the LORD, By His fierce anger. 27. For thus says the LORD: “The whole land shall be desolate; Yet I will not make a full end. 28. For this shall the earth mourn, And the heavens above be black, Because I have spoken. I have purposed and will not relent, Nor will I turn back from it. 29. The whole city shall flee from the noise of the horsemen and bowmen. They shall go into thickets and climb up on the rocks. Every city shall be forsaken, And not a man shall dwell in it. 30. “And when you are plundered, What will you do? Though you clothe yourself with crimson, Though you adorn yourself with ornaments of gold, Though you enlarge your eyes with paint, In vain you will make yourself fair; Your lovers will despise you; They will seek your life. 1. “They say, “If a man divorces his wife, And she goes from him And becomes another man’s, May he return to her again?’ Would not that land be greatly polluted? But you have played the harlot with many lovers; Yet return to Me,” says the LORD. 2. “Lift up your eyes to the desolate heights and see: Where have you not lain with men? By the road you have sat for them Like an Arabian in the wilderness; And you have polluted the land With your harlotries and your wickedness. 3. Therefore the showers have been withheld, And there has been no latter rain. You have had a harlot’s forehead; You refuse to be ashamed. 4. Will you not from this time cry to Me, “My Father, You are the guide of my youth? 6. The LORD said also to me in the days of Josiah the king: “Have you seen what backsliding Israel has done? She has gone up on every high mountain and under every green tree, and there played the harlot. 7. And I said, after she had done all these things, “Return to Me.’ But she did not return. And her treacherous sister Judah saw it. 8. Then I saw that for all the causes for which backsliding Israel had committed adultery, I had put her away and given her a certificate of divorce; yet her treacherous sister Judah did not fear, but went and played the harlot also. 9. So it came to pass, through her casual harlotry, that she defiled the land and committed adultery with stones and trees. 10. And yet for all this her treacherous sister Judah has not turned to Me with her whole heart, but in pretense,” says the LORD. 11. Then the LORD said to me, “Backsliding Israel has shown herself more righteous than treacherous Judah. 12. Go and proclaim these words toward the north, and say: “Return, backsliding Israel,’ says the LORD; “I will not cause My anger to fall on you. For I am merciful,’ says the LORD; “I will not remain angry forever. 13. Only acknowledge your iniquity, That you have transgressed against the LORD your God, And have scattered your charms To alien deities under every green tree, And you have not obeyed My voice,’ says the LORD. 14. “Return, O backsliding children,” says the LORD; “for I am married to you. I will take you, one from a city and two from a family, and I will bring you to Zion. 15. And I will give you shepherds according to My heart, who will feed you with knowledge and understanding. 16. “Then it shall come to pass, when you are multiplied and increased in the land in those days,” says the LORD, “that they will say no more, “The ark of the covenant of the LORD.’ It shall not come to mind, nor shall they remember it, nor shall they visit it, nor shall it be made anymore. 17. “At that time Jerusalem shall be called The Throne of the LORD, and all the nations shall be gathered to it, to the name of the LORD, to Jerusalem. No more shall they follow the dictates of their evil hearts. 18. “In those days the house of Judah shall walk with the house of Israel, and they shall come together out of the land of the north to the land that I have given as an inheritance to your fathers. 20. Surely, as a wife treacherously departs from her husband, So have you dealt treacherously with Me, O house of Israel,” says the LORD. 21. A voice was heard on the desolate heights, Weeping and supplications of the children of Israel. For they have perverted their way; They have forgotten the LORD their God. 22. “Return, you backsliding children, And I will heal your backslidings.Indeed we do come to You, For You are the LORD our God. 23. Truly, in vain is salvation hoped for from the hills, And from the multitude of mountains; Truly, in the LORD our God Is the salvation of Israel. 24. For shame has devoured The labor of our fathers from our youth–Their flocks and their herds, Their sons and their daughters. 2. “Go and cry in the hearing of Jerusalem, saying, “Thus says the LORD: “I remember you, The kindness of your youth, The love of your betrothal, When you went after Me in the wilderness, In a land not sown. 4. Hear the word of the LORD, O house of Jacob and all the families of the house of Israel. 5. Thus says the LORD: “What injustice have your fathers found in Me, That they have gone far from Me, Have followed idols, And have become idolaters? 7. I brought you into a bountiful country, To eat its fruit and its goodness. But when you entered, you defiled My land And made My heritage an abomination. 8. The priests did not say, “Where is the LORD?’ And those who handle the law did not know Me; The rulers also transgressed against Me; The prophets prophesied by Baal, And walked after things that do not profit. 9. “Therefore I will yet bring charges against you,” says the LORD, “And against your children’s children I will bring charges. 10. For pass beyond the coasts of Cyprus and see, Send to Kedar and consider diligently, And see if there has been such a thing. 11. Has a nation changed its gods, Which are not gods? But My people have changed their Glory For what does not profit. 12. Be astonished, O heavens, at this, And be horribly afraid; Be very desolate,” says the LORD. 13. “For My people have committed two evils: They have forsaken Me, the fountain of living waters, And hewn themselves cisterns–broken cisterns that can hold no water. 14. “Is Israel a servant? Is he a homeborn slave? Why is he plundered? 15. The young lions roared at him, and growled; They made his land waste; His cities are burned, without inhabitant. 16. Also the people of Noph and Tahpanhes Have broken the crown of your head. 17. Have you not brought this on yourself, In that you have forsaken the LORD your God When He led you in the way? 18. And now why take the road to Egypt, To drink the waters of Sihor? Or why take the road to Assyria, To drink the waters of the River? 19. Your own wickedness will correct you, And your backslidings will rebuke you. Know therefore and see that it is an evil and bitter thing That you have forsaken the LORD your God, And the fear of Me is not in you,” Says the Lord GOD of hosts. 20. “For of old I have broken your yoke and burst your bonds; And you said, “I will not transgress,’ When on every high hill and under every green tree You lay down, playing the harlot. 21. Yet I had planted you a noble vine, a seed of highest quality. How then have you turned before Me Into the degenerate plant of an alien vine? 22. For though you wash yourself with lye, and use much soap, Yet your iniquity is marked before Me,” says the Lord GOD. 24. A wild donkey used to the wilderness, That sniffs at the wind in her desire; In her time of mating, who can turn her away? All those who seek her will not weary themselves; In her month they will find her. 28. But where are your gods that you have made for yourselves? Let them arise, If they can save you in the time of your trouble; For according to the number of your cities Are your gods, O Judah. 29. “Why will you plead with Me? You all have transgressed against Me,” says the LORD. 30. “In vain I have chastened your children; They received no correction. Your sword has devoured your prophets Like a destroying lion. 31. “O generation, see the word of the LORD! Have I been a wilderness to Israel, Or a land of darkness? Why do My people say, “We are lords; We will come no more to You’? 32. Can a virgin forget her ornaments, Or a bride her attire? Yet My people have forgotten Me days without number. 33. “Why do you beautify your way to seek love? Therefore you have also taught The wicked women your ways. 34. Also on your skirts is found The blood of the lives of the poor innocents. I have not found it by secret search, But plainly on all these things. 36. Why do you gad about so much to change your way? Also you shall be ashamed of Egypt as you were ashamed of Assyria. 37. Indeed you will go forth from him With your hands on your head; For the LORD has rejected your trusted allies, And you will not prosper by them. 3. It came also in the days of Jehoiakim the son of Josiah, king of Judah, until the end of the eleventh year of Zedekiah the son of Josiah, king of Judah, until the carrying away of Jerusalem captive in the fifth month. 7. But the LORD said to me: “Do not say, “I am a youth,’ For you shall go to all to whom I send you, And whatever I command you, you shall speak. 8. Do not be afraid of their faces, For I am with you to deliver you,” says the LORD. 9. Then the LORD put forth His hand and touched my mouth, and the LORD said to me: “Behold, I have put My words in your mouth. 14. Then the LORD said to me: “Out of the north calamity shall break forth On all the inhabitants of the land. 15. For behold, I am calling All the families of the kingdoms of the north,” says the LORD; “They shall come and each one set his throne At the entrance of the gates of Jerusalem, Against all its walls all around, And against all the cities of Judah. 16. I will utter My judgments Against them concerning all their wickedness, Because they have forsaken Me, Burned incense to other gods, And worshiped the works of their own hands. 17. “Therefore prepare yourself and arise, And speak to them all that I command you. Do not be dismayed before their faces, Lest I dismay you before them. 18. For behold, I have made you this day A fortified city and an iron pillar, And bronze walls against the whole land–Against the kings of Judah, Against its princes, Against its priests, And against the people of the land. 이사야는 남 유다의 선지자다. 북 이스라엘이 앗시리아에 멸망당하던 주전 722년을 전후로 활동했던 선지자다. 이사야는 북 이스라엘이 어떻게 멸망하는지를 두눈으로 똑똑히 지켜보았을 것이다. 그리고 하나님으로부터 오는 음성을 들었을 것이다. 그것은 남 유다 예루살렘에 대한 경고의 성격을 띠게됐다. 하나님의 율법을 지키고 그 명령을 따르면 구원을 받겠으나 하나님을 멀리하면 엄한 심판과 멸망을 자초하게 될 것이란 메시지였다. 이사야의 준엄한 메시지 덕분이었는지 예루살렘은 앗시리아의 전면 공격을 받았을 때에 그 일촉즉발의 위기를 모면하게 된다. 히스기야를 선두로 한 전 예루살렘 거민들의 기도로 앗시리아의 18만 5천명을 물리치게 된다. 성경에서는 그들이 하룻밤 사이에 모두 시체로 변했다고 기록하고 있다. 앗시리아는 예루살렘과의 공성전 실패로 제국의 힘이 급격히 기울기 시작한다. 결국 바벨론에게 멸망당한다. 남 유다는 마치 자신이 앗시리아 제국을 무너뜨린 것처럼 의기양양했을 것이다. 하지만 주전 586년 경에 바벨론 느부갓네살 왕에의해 예루살렘은 철저한 유린을 당하게 된다. 이사야가 그렇게 조심할 것을 외쳤건만 남 유다의 귀에는 이사야의 말이 먼 산에 개 짖는 소리로 들렸을 것이다. 왜냐하먄 히스기야 시대에 세계 최강대국인 앗시리아와 겨루어 이긴 경험이 있었기 때문이다. 이사야는 한반도에 사는 이들에게 어떤 교훈을 주는가? 남북으로 나누어진 한반도는 같은 동족이었던 북 이스라엘과 남 유다를 떠올리게 한다. 당시 강대국이었던 앗시리아와 이집트는 한반도를 둘러싼 중국과 미국을 떠올리게 한다. 당시 남 유다에는 친 앗시리아파와 친 이집트파가 있었다. 현재 한국에는 친 중국파와 친 미국파가 대립하고 있다. 한국은 북한의 경제와 삶이 어떻게 철저히 유린 당하는지를 보아왔다. 그리고 남한의 경제가 역사적으로 유례를 찾아 볼 수 없을 정도의 급성장을 체험한다. 하지만 하나님께서는 19997년 IMF와 2008년 세계 경제침체를 통해 경제적인 성장이 전부가 아니란 메시지를 보냈다. 이사야는 당시 남 유다를 향해 정의를 실천할 것과 고아와 과부를 돌볼 것과 진정한 회개를 강조했다. 대한민국에는 보편적인 정의가 사라진지 오래다. 검찰에 대한 불신이 하늘을 찌르고 있다. 고아와 과부보다는 박정희 이후 개발독재의 혜택을 입은 기업들이 여전히 떵떵거리며 큰소리치고 있다. 교회는 국가권력에게 표를 주는 대신, 자신들을 위한 각종 혜택을 누리고 있다. 백성들 편에 서야 할 제사장들이나 종교 지도자들은 자신들의 조직 유지와 성장에 급급하다. 가장 대형교단이라고 자처하는 모 교단은 십일조를 하지 않는 사람은 아예 교회에 나오지 말라는 법적 조처를 발표하기도 한다. 예루살렘 멸망 이전의 유다가 이만큼이나 타락했을까 하는 생각이 든다. 이사야는 이러한 상황을 타개하기위해 철저한 회개를 촉구한다. 대한민국의 지도자들이 작금의 현실을 똑바로 직시하지 않을 때 ‘설마 기독교인이 가장 많다는 대한민국에 무슨 일이 일어날까?’했던 그 설마를 현실로 바꿀 것이라고 경고하고 있다. 하지만 이사야의 경고를 받아들이고 고아와 과부를 보살피고 정의를 실천할 경우에는 한없는 축복이 임할 것임을 예언한다. 그 선택의 출발은 강대국으로부터 주어지는 것이 아니라 ‘나’로부터 시작된다는 사실을 명심해야 할 것이다. 1. Thus says the LORD: “Heaven is My throne, And earth is My footstool. Where is the house that you will build Me? And where is the place of My rest? 2. For all those things My hand has made, And all those things exist,” Says the LORD. “But on this one will I look: On him who is poor and of a contrite spirit, And who trembles at My word. 6. The sound of noise from the city! A voice from the temple! The voice of the LORD, Who fully repays His enemies! 7. “Before she was in labor, she gave birth; Before her pain came, She delivered a male child. 8. Who has heard such a thing? Who has seen such things? Shall the earth be made to give birth in one day? Or shall a nation be born at once? For as soon as Zion was in labor, She gave birth to her children. 9. Shall I bring to the time of birth, and not cause delivery?” says the LORD. “Shall I who cause delivery shut up the womb?” says your God. 12. For thus says the LORD: “Behold, I will extend peace to her like a river, And the glory of the Gentiles like a flowing stream. Then you shall feed; On her sides shall you be carried, And be dandled on her knees. 14. When you see this, your heart shall rejoice, And your bones shall flourish like grass; The hand of the LORD shall be known to His servants, And His indignation to His enemies. 15. For behold, the LORD will come with fire And with His chariots, like a whirlwind, To render His anger with fury, And His rebuke with flames of fire. 16. For by fire and by His sword The LORD will judge all flesh; And the slain of the LORD shall be many. 17. “Those who sanctify themselves and purify themselves, To go to the gardens After an idol in the midst, Eating swine’s flesh and the abomination and the mouse, Shall be consumed together,” says the LORD. 18. “For I know their works and their thoughts. It shall be that I will gather all nations and tongues; and they shall come and see My glory. 19. I will set a sign among them; and those among them who escape I will send to the nations: to Tarshish and Pul and Lud, who draw the bow, and Tubal and Javan, to the coastlands afar off who have not heard My fame nor seen My glory. And they shall declare My glory among the Gentiles. 20. Then they shall bring all your brethren for an offering to the LORD out of all nations, on horses and in chariots and in litters, on mules and on camels, to My holy mountain Jerusalem,” says the LORD, “as the children of Israel bring an offering in a clean vessel into the house of the LORD. 21. And I will also take some of them for priests and Levites,” says the LORD. 22. “For as the new heavens and the new earth Which I will make shall remain before Me,” says the LORD, “So shall your descendants and your name remain. 23. And it shall come to pass That from one New Moon to another, And from one Sabbath to another, All flesh shall come to worship before Me,” says the LORD. 1. “I was sought by those who did not ask for Me; I was found by those who did not seek Me. I said, “Here I am, here I am,’ To a nation that was not called by My name. 5. Who say, “Keep to yourself, Do not come near me, For I am holier than you!’ These are smoke in My nostrils, A fire that burns all the day. 8. Thus says the LORD: “As the new wine is found in the cluster, And one says, “Do not destroy it, For a blessing is in it,’ So will I do for My servants’ sake, That I may not destroy them all. 9. I will bring forth descendants from Jacob, And from Judah an heir of My mountains; My elect shall inherit it, And My servants shall dwell there. 10. Sharon shall be a fold of flocks, And the Valley of Achor a place for herds to lie down, For My people who have sought Me. 11. “But you are those who forsake the LORD, Who forget My holy mountain, Who prepare a table for Gad, And who furnish a drink offering for Meni. 14. Behold, My servants shall sing for joy of heart, But you shall cry for sorrow of heart, And wail for grief of spirit. 16. So that he who blesses himself in the earth Shall bless himself in the God of truth; And he who swears in the earth Shall swear by the God of truth; Because the former troubles are forgotten, And because they are hidden from My eyes. 17. “For behold, I create new heavens and a new earth; And the former shall not be remembered or come to mind. 18. But be glad and rejoice forever in what I create; For behold, I create Jerusalem as a rejoicing, And her people a joy. 19. I will rejoice in Jerusalem, And joy in My people; The voice of weeping shall no longer be heard in her, Nor the voice of crying. 20. “No more shall an infant from there live but a few days, Nor an old man who has not fulfilled his days; For the child shall die one hundred years old, But the sinner being one hundred years old shall be accursed. 21. They shall build houses and inhabit them; They shall plant vineyards and eat their fruit. 22. They shall not build and another inhabit; They shall not plant and another eat; For as the days of a tree, so shall be the days of My people, And My elect shall long enjoy the work of their hands. 23. They shall not labor in vain, Nor bring forth children for trouble; For they shall be the descendants of the blessed of the LORD, And their offspring with them. 24. “It shall come to pass That before they call, I will answer; And while they are still speaking, I will hear. 25. The wolf and the lamb shall feed together, The lion shall eat straw like the ox, And dust shall be the serpent’s food. They shall not hurt nor destroy in all My holy mountain,” Says the LORD. 2. As fire burns brushwood, As fire causes water to boil–To make Your name known to Your adversaries, That the nations may tremble at Your presence! 3. When You did awesome things for which we did not look, You came down, The mountains shook at Your presence. 4. For since the beginning of the world Men have not heard nor perceived by the ear, Nor has the eye seen any God besides You, Who acts for the one who waits for Him. 5. You meet him who rejoices and does righteousness, Who remembers You in Your ways. You are indeed angry, for we have sinned–In these ways we continue; And we need to be saved. 6. But we are all like an unclean thing, And all our righteousnesses are like filthy rags; We all fade as a leaf, And our iniquities, like the wind, Have taken us away. 7. And there is no one who calls on Your name, Who stirs himself up to take hold of You; For You have hidden Your face from us, And have consumed us because of our iniquities. 8. But now, O LORD, You are our Father; We are the clay, and You our potter; And all we are the work of Your hand. 9. Do not be furious, O LORD, Nor remember iniquity forever; Indeed, please look–we all are Your people! 10. Your holy cities are a wilderness, Zion is a wilderness, Jerusalem a desolation. 11. Our holy and beautiful temple, Where our fathers praised You, Is burned up with fire; And all our pleasant things are laid waste. 12. Will You restrain Yourself because of these things, O LORD? Will You hold Your peace, and afflict us very severely? 2. Why is Your apparel red, And Your garments like one who treads in the winepress? 3. “I have trodden the winepress alone, And from the peoples no one was with Me. For I have trodden them in My anger, And trampled them in My fury; Their blood is sprinkled upon My garments, And I have stained all My robes. 5. I looked, but there was no one to help, And I wondered That there was no one to uphold; Therefore My own arm brought salvation for Me; And My own fury, it sustained Me. 7. I will mention the lovingkindnesses of the LORD And the praises of the LORD, According to all that the LORD has bestowed on us, And the great goodness toward the house of Israel, Which He has bestowed on them according to His mercies, According to the multitude of His lovingkindnesses. 8. For He said, “Surely they are My people, Children who will not lie.” So He became their Savior. 9. In all their affliction He was afflicted, And the Angel of His Presence saved them; In His love and in His pity He redeemed them; And He bore them and carried them All the days of old. 10. But they rebelled and grieved His Holy Spirit; So He turned Himself against them as an enemy, And He fought against them. 14. As a beast goes down into the valley, And the Spirit of the LORD causes him to rest, So You lead Your people, To make Yourself a glorious name. 15. Look down from heaven, And see from Your habitation, holy and glorious. Where are Your zeal and Your strength, The yearning of Your heart and Your mercies toward me? Are they restrained? 16. Doubtless You are our Father, Though Abraham was ignorant of us, And Israel does not acknowledge us. You, O LORD, are our Father; Our Redeemer from Everlasting is Your name. 17. O LORD, why have You made us stray from Your ways, And hardened our heart from Your fear? Return for Your servants’ sake, The tribes of Your inheritance. 18. Your holy people have possessed it but a little while; Our adversaries have trodden down Your sanctuary. 19. We have become like those of old, over whom You never ruled, Those who were never called by Your name. 1. For Zion’s sake I will not hold My peace, And for Jerusalem’s sake I will not rest, Until her righteousness goes forth as brightness, And her salvation as a lamp that burns. 2. The Gentiles shall see your righteousness, And all kings your glory. You shall be called by a new name, Which the mouth of the LORD will name. 3. You shall also be a crown of glory In the hand of the LORD, And a royal diadem In the hand of your God. 4. You shall no longer be termed Forsaken, Nor shall your land any more be termed Desolate; But you shall be called Hephzibah, and your land Beulah; For the LORD delights in you, And your land shall be married. 5. For as a young man marries a virgin, So shall your sons marry you; And as the bridegroom rejoices over the bride, So shall your God rejoice over you. 7. And give Him no rest till He establishes And till He makes Jerusalem a praise in the earth. 8. The LORD has sworn by His right hand And by the arm of His strength: “Surely I will no longer give your grain As food for your enemies; And the sons of the foreigner shall not drink your new wine, For which you have labored. 10. Go through, Go through the gates! Prepare the way for the people; Build up, Build up the highway! Take out the stones, Lift up a banner for the peoples! 12. And they shall call them The Holy People, The Redeemed of the LORD; And you shall be called Sought Out, A City Not Forsaken.